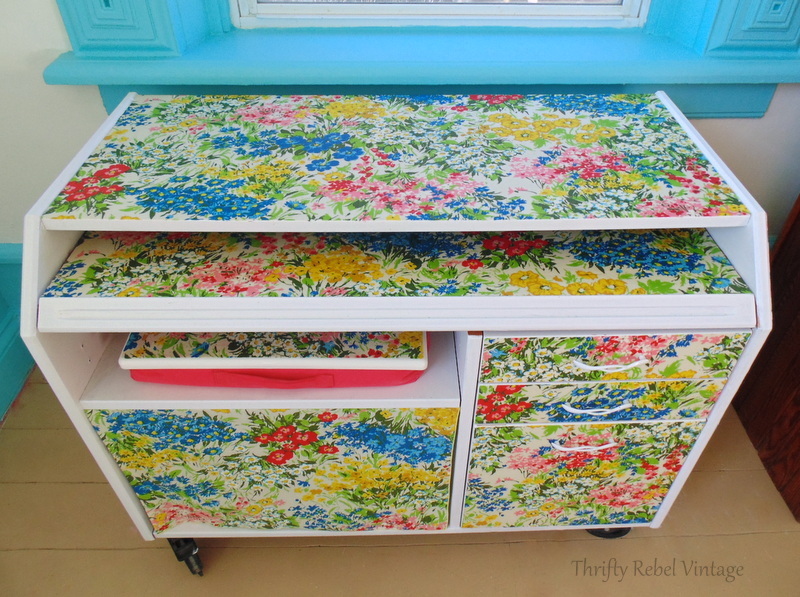 If you ever see a dated piece of wooden furniture for a great price, but don’t know what to do with it… think of decoupage and bring that baby home. 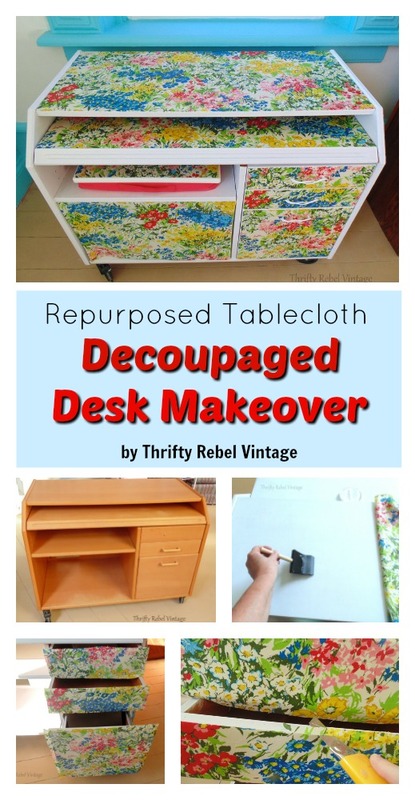 You can give it a completely new look, like this decoupaged desk makeover that I’m sharing today… and the possibilities for customizing are really endless. 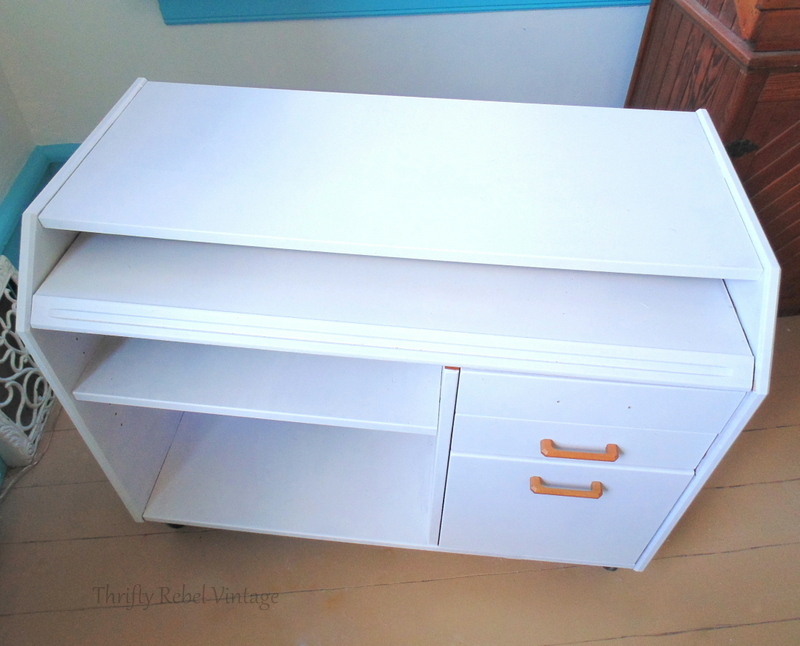 Here’s the desk that I found at the Habitat for Humanity Restore for $40, and it included a chair that I showed at the beginning of this living room makeover adventure. Please ignore the living room floor. It’ll be getting a makeover after everything else is done. 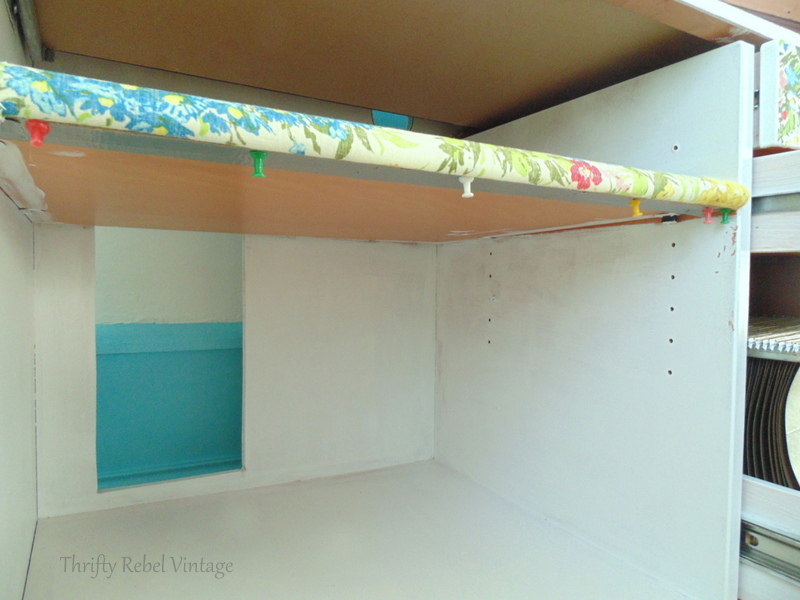 I always do the floor last in room makeovers because then I don’t have to worry about paint drips etc. 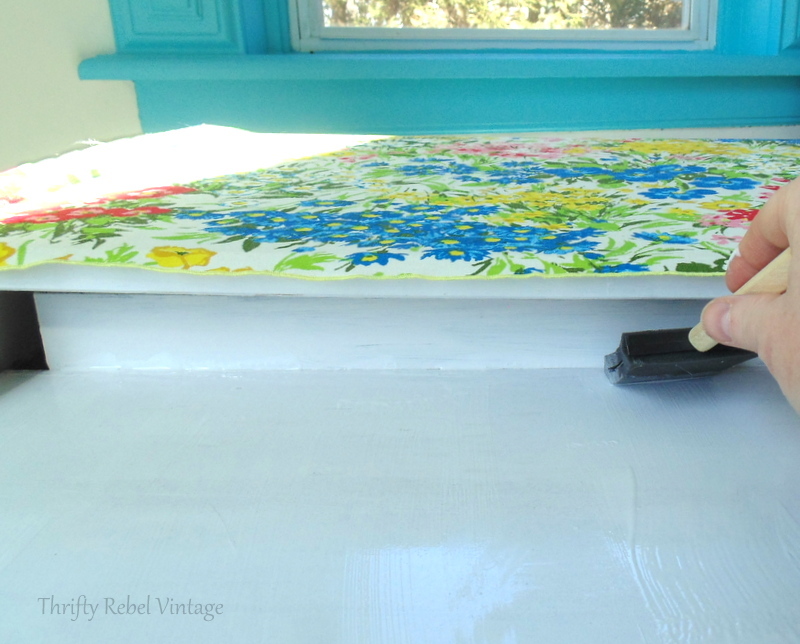 This makes room makeovers fun and not the least bit stressful. 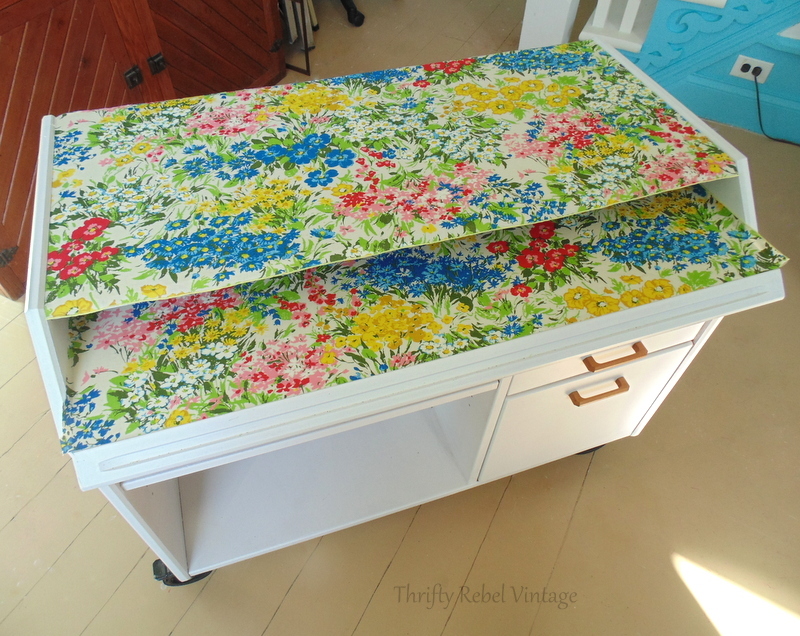 So to start my decoupaged desk makeover I painted the whole thing white because I didn’t want to risk the wood color showing through the fabric. Using a brush and a mini roller it took two coats. I didn’t worry about priming or sanding because I’m covering most of the paint with fabric. 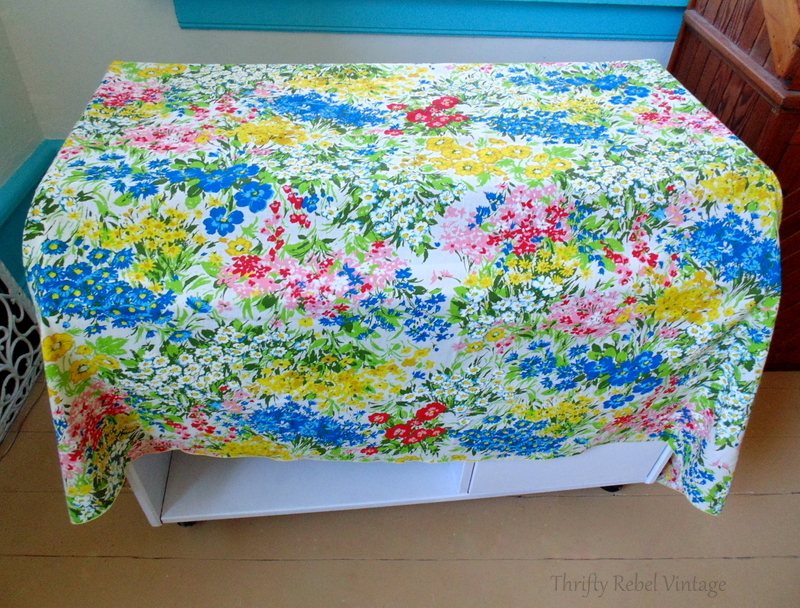 Here’s the $1 thrifted floral tablecloth that was hanging in a doorway in my aqua and red kitchen… until I found a scarf that worked better in that spot. 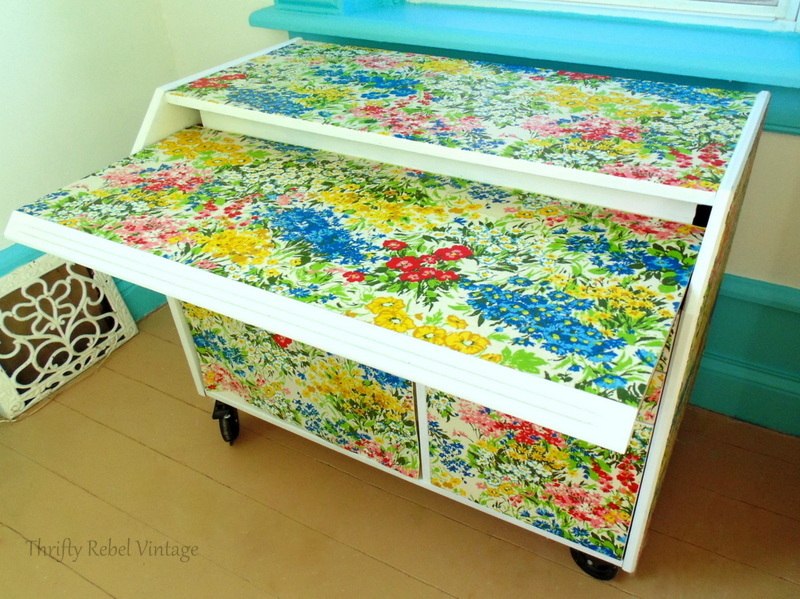 Then I found this desk, and since I’m a girl who loves flowers… it seemed pretty meant to be to me. 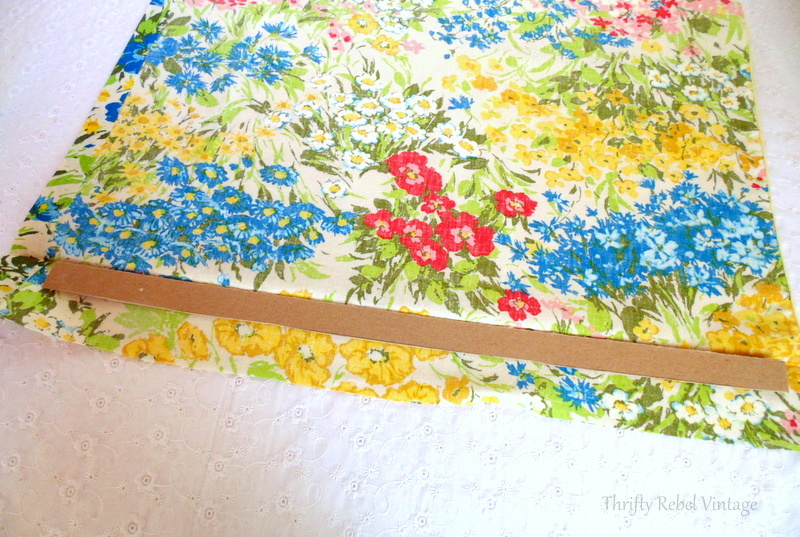 I measured and cut the fabric the sizes that I needed for the desk top and pull out shelf… and went to work. 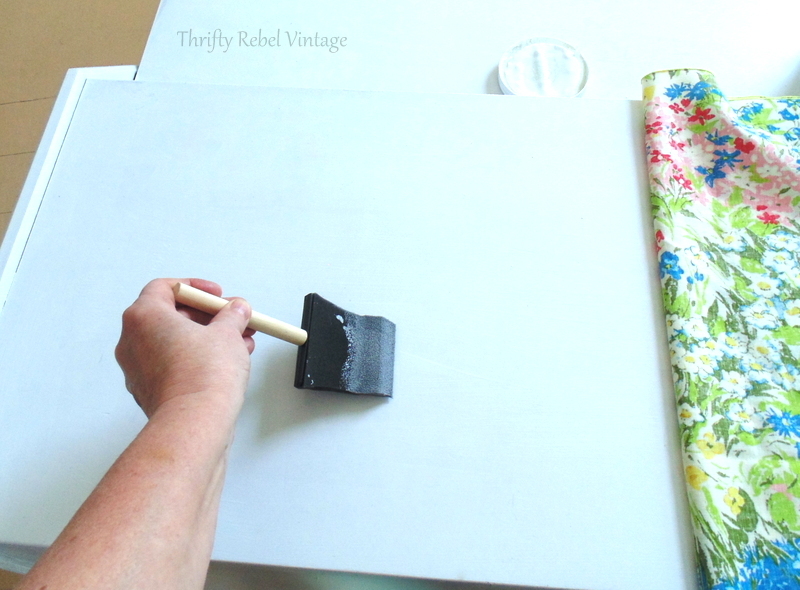 You can get access to my complete list of must-have decoupage tools at the bottom of this post. 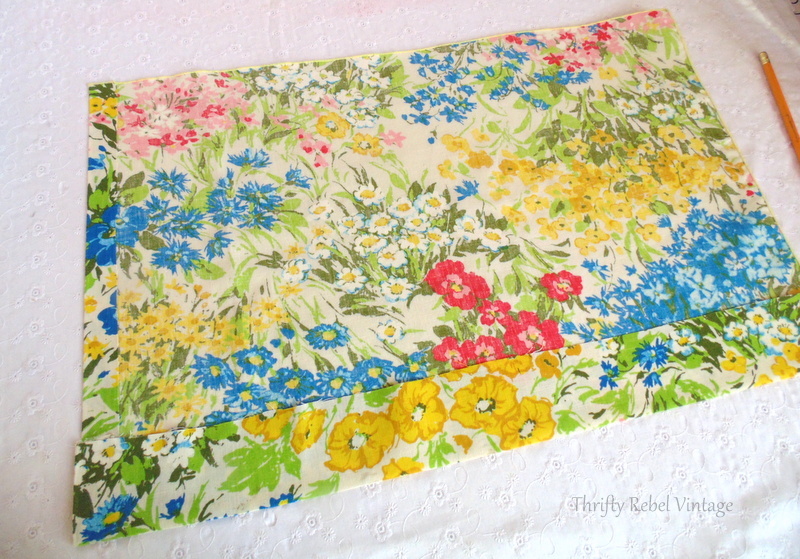 and I worked my way across… smoothing the fabric along as I went. I smoothed out the top as much as I could, and then I did the same thing to the pull out shelf. Then I gave both tops three coats of Mod Podge, including the overhanging pieces of fabric. I’ll show you why a little bit later. 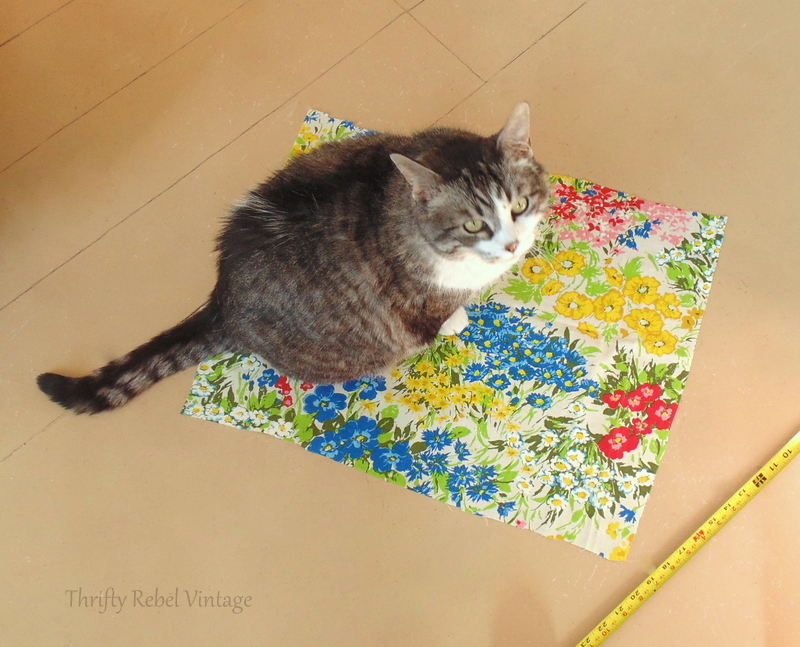 Miss Monkey is my number 1 assistant, and is always more than willing to help me with every project. 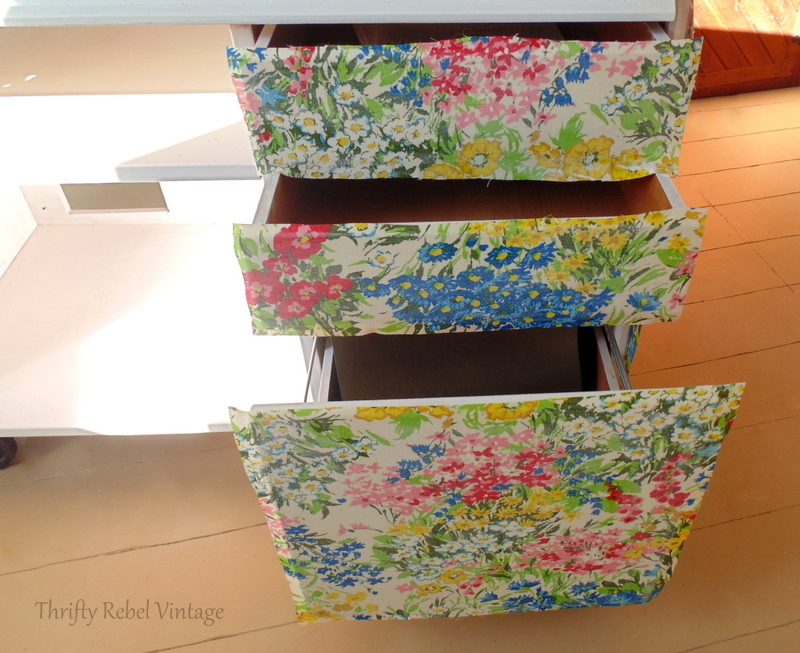 I measured, cut, and applied the fabric to the drawers leaving some overhanging fabric. After a couple of coats of MP on everything and the overhanging fabric bits, I trimmed up the whole desk using a very sharp knife. 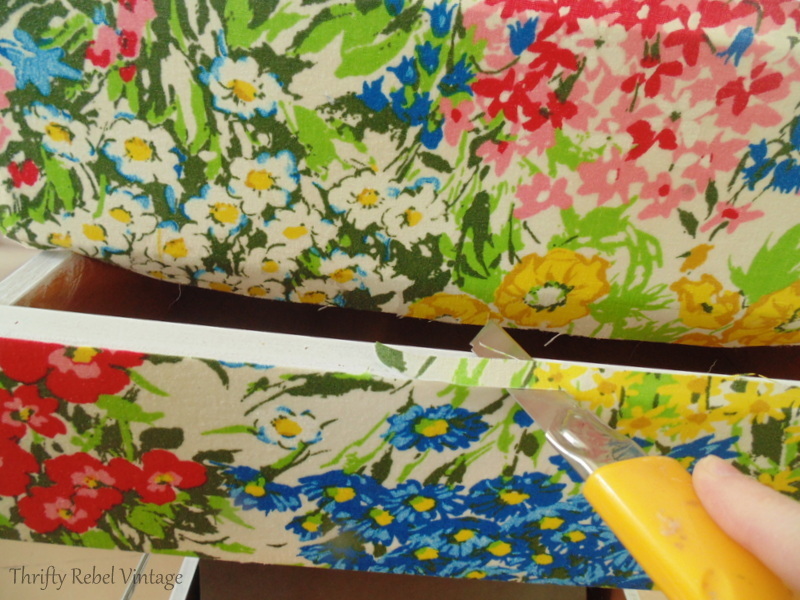 When you apply the Mod Podge to the overhanging fabric and let it harden you’ll get nice crisp edges when you trim. You don’t need to use any pressure at all. Simply run the knife along the edge of the desk and it’ll do all the work for you. The trick is the knife needs to be super sharp. Now I wanted to do something about that with big open space. So I decided simple no sew skirt would do the trick just fine. I used a corner of the tablecloth so I only needed to hem one side. So I ironed some hemming tape on that side. 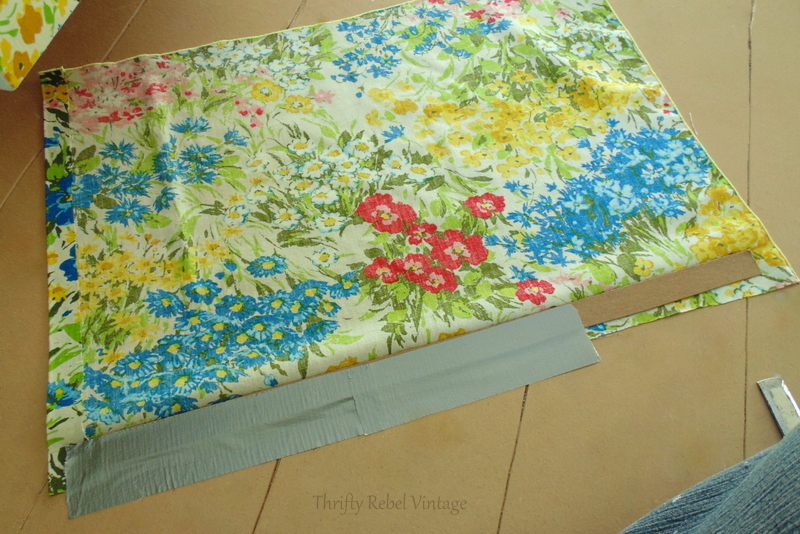 You simply iron your hem, stick the tape between the fabric and then apply the iron again. I think there’s also double sided hemming tape that doesn’t need ironing, but this is what I had. After ironing the fabric hem along the top, I cut a piece of cardboard to help keep my nice straight edge. 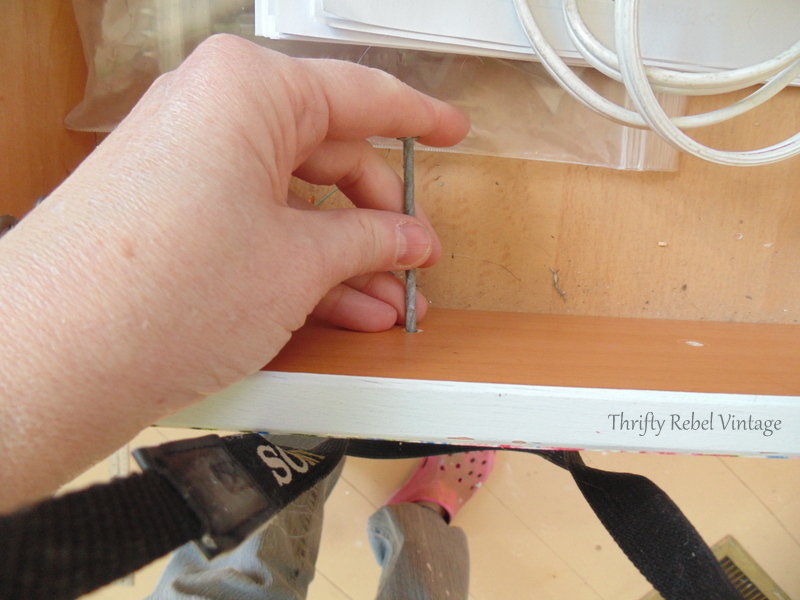 … which helped me hold the skirt in place so I could apply some tacks. I just used what I had in my craft room. This desk will be my blog office so I’m keeping all my blogging courses info in here, but I don’t want to see it all the time… so this is perfect. I didn’t cover the top shelf because I wanted easy access to my lap desk, and it’s the perfect size for it. 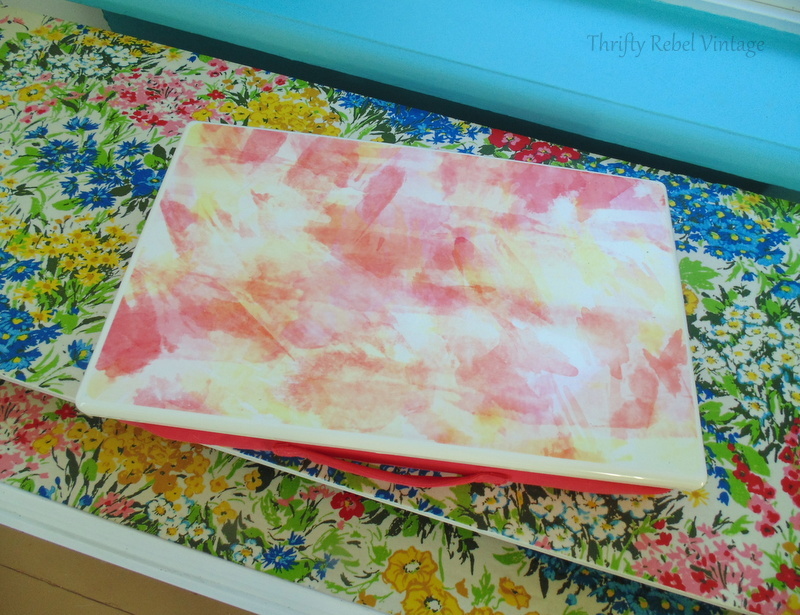 Here’s what my lap desk looked like before I decoupaged it with the same fabric. 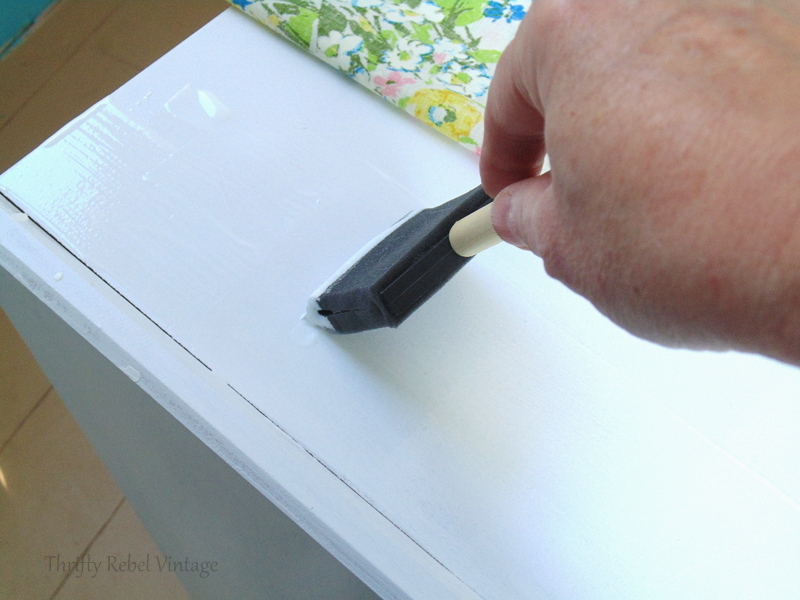 I gave the drawers one final coat of Mod Podge, which makes 4 altogether… and I sanded lightly after 3 coats. Here you can see that the MP goes on white, but it dries beautifully clear. 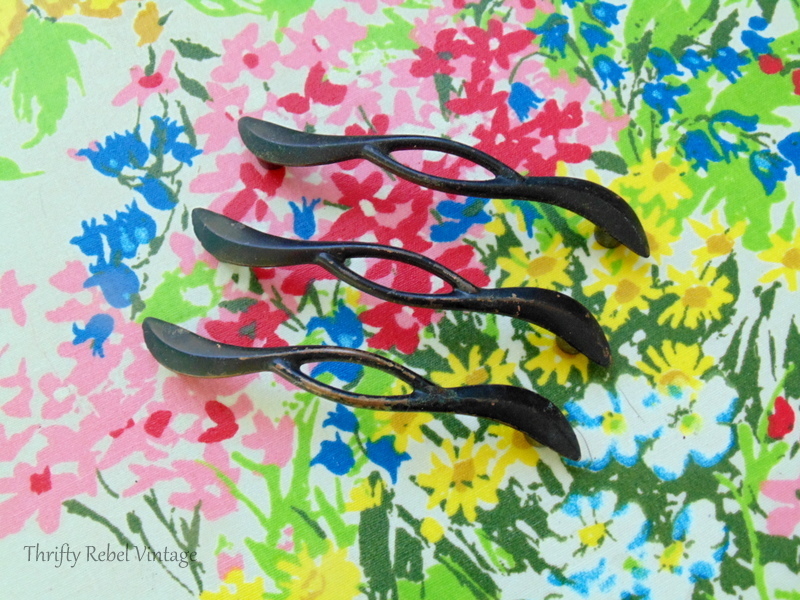 I found these drawer handles in my stash. 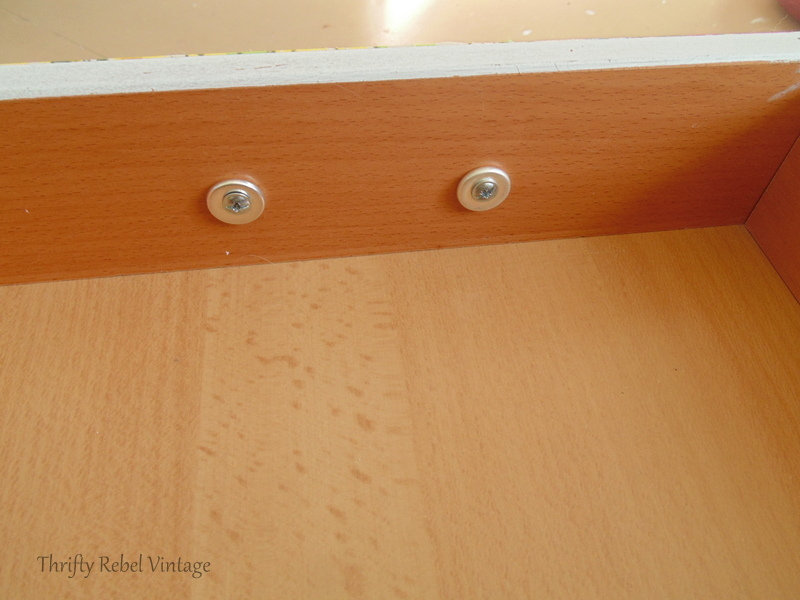 I found a nail just the right size, and gently poked it through the existing holes. Then I poked it through the holes from the outside. My flat end screws were a little too long so I found these washer-like thingies in my stash and they worked perfectly. 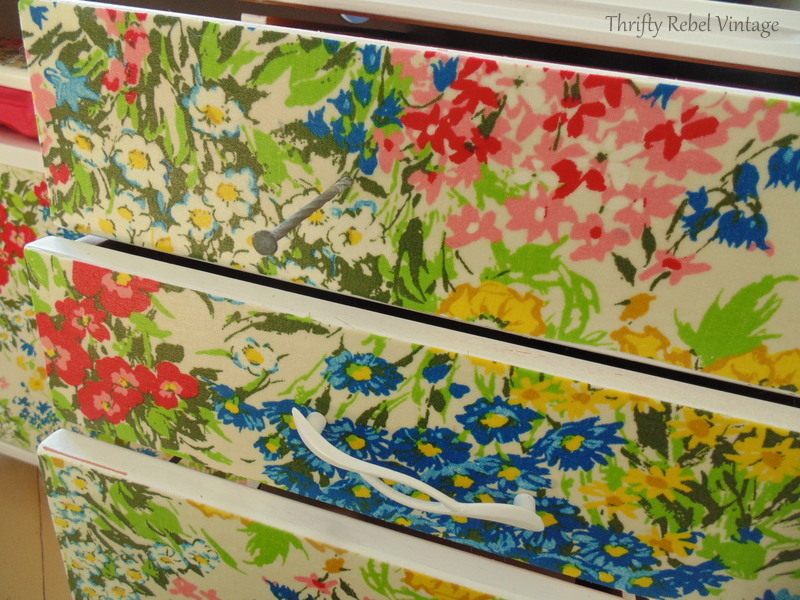 I spray painted the drawer handles white, and I like that they don’t take away from the fabulously floral fabric. The handles are there to be purely practical. The fabric is the star here. 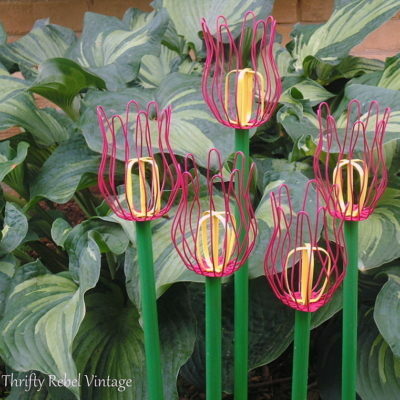 I’m talking mega flower power, but it ‘s so pretty… sort of reminds me of impressionistic art, which I love. 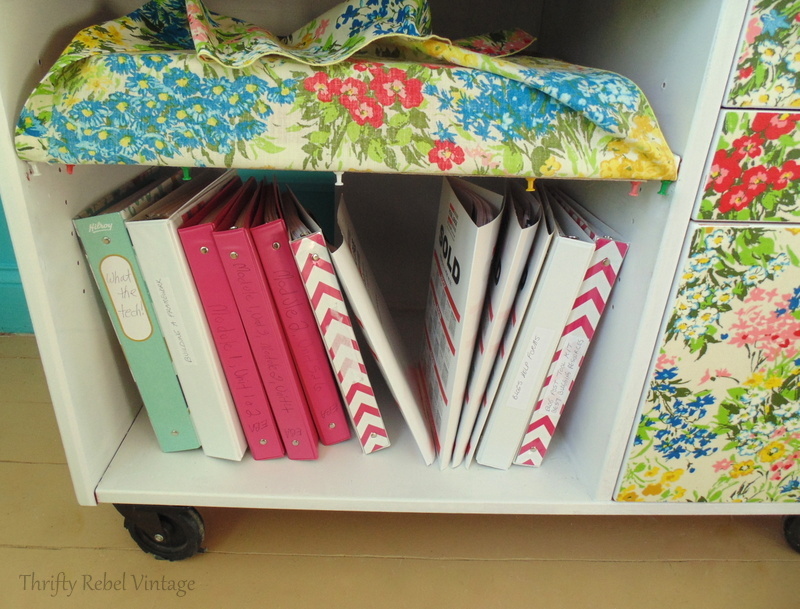 Here’s the pull out shelf where I keep my lap top. I look forward to spending many hours writing at this desk… looking though the window at the front gardens and watching the birds. And the super pretty after. It just makes me smile, and I’m so happy with how it turned out. 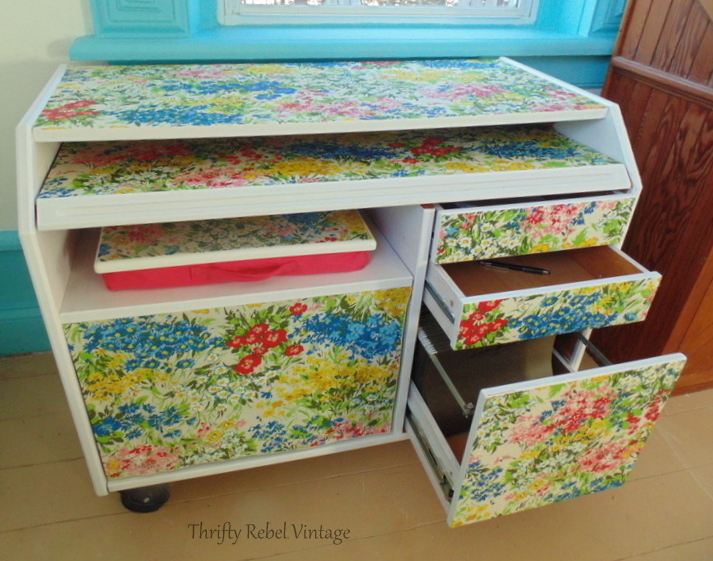 You don’t have to be an expert to decoupage, and you can make almost anything look just the way you want it to. Don’t forget to pin this to your favourite Pinterest board. I LOVE IT!! I’m inspired now!! Wow! What a great project and so colorful. You make it look so easy! 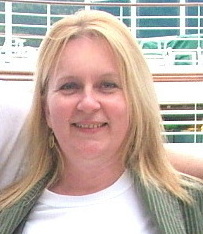 Thanks Diane! It really is pretty easy. Reminds me of cutting and pasting as a little girl, just on a bigger scale. It’s all in the measuring and the trimming really. 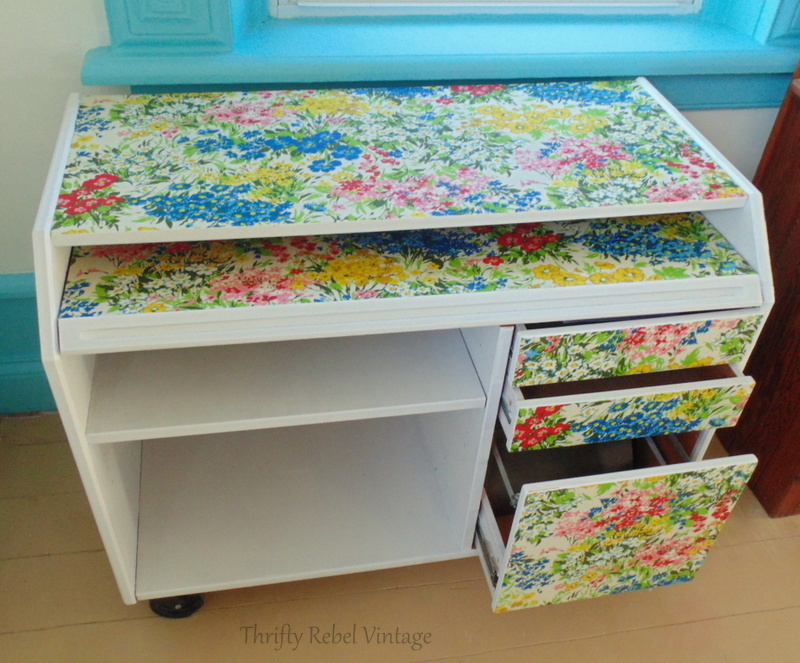 Wow, that’s a Monet picture and desk all rolled into one! And it sure brightens up that outdated desk. I would never have thought of doing that, but it gives me an idea for something I have here. Thanks Florence! 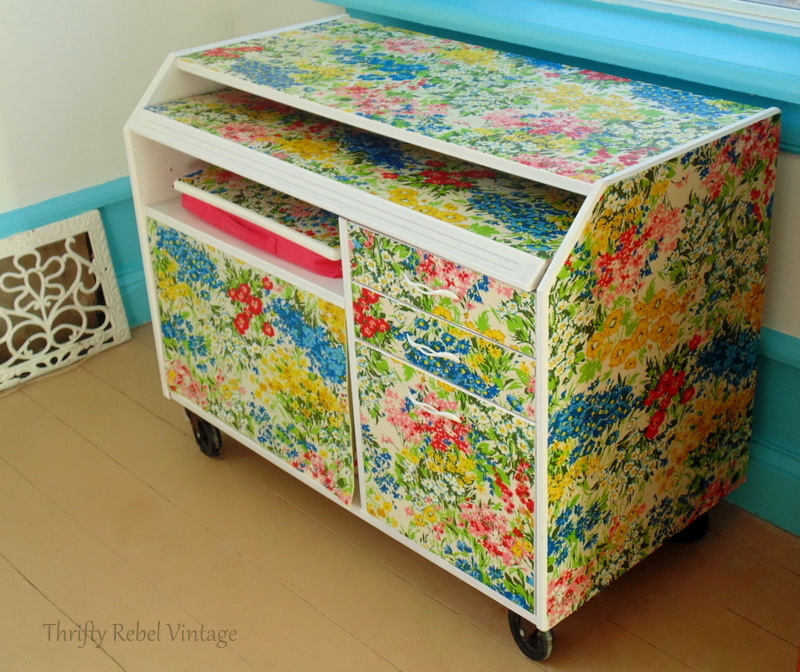 I’m really loving decoupage lately. It’s such a great way to transform almost anything. The creative possibilities are endless. Thanks very much Dona! I was so lucky to find that tablecloth. 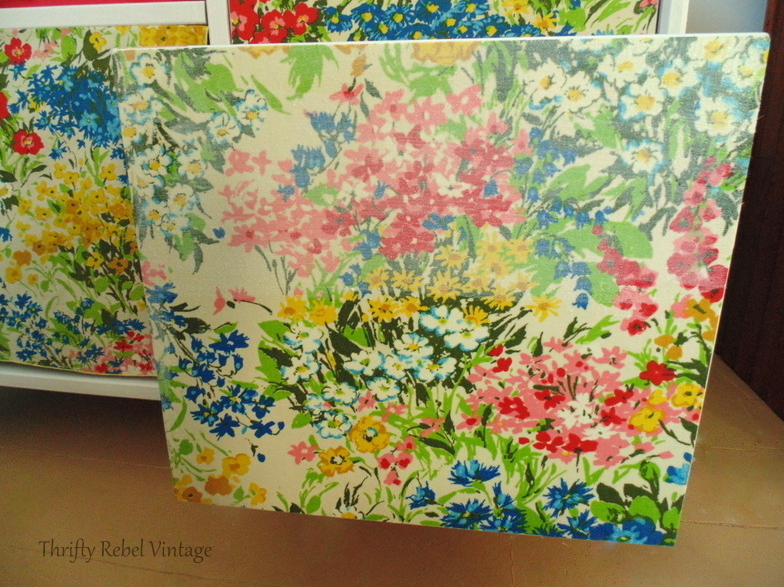 It’s just right for the desk, which is already making the living room so much cheerier and the winter a lot less drearier. Another pretty project Tuula! I love seeing what you are up to. Thanks AnnMarie! It took longer than I planned to get to this project, but now that it’s done I’m so happy with it. Hey Tuula, that is one of the most beautiful redos I’ve ever seen. Thanks for sharing!! Awesome as always!! Love how it turned out ♥ What luck to have it just right under your window ledge! Thanks Deb! 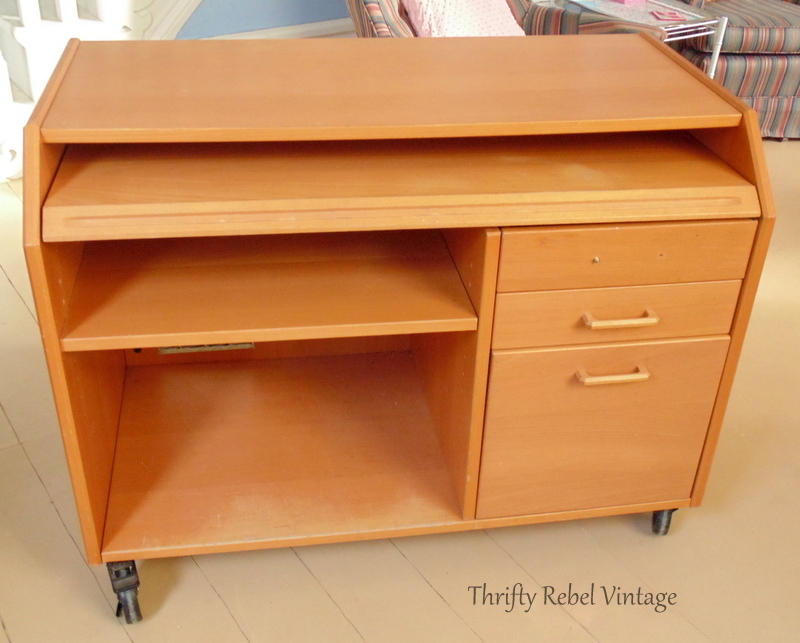 Yes, the desk fit perfectly, and is on wheels making it so easy to move if need be. OMG, that is SO CUTE Tuula! Pinned! Thanks Tania! I finally found the perfect use for that tablecloth. I love what you did here! So pretty. Hi Tuula, the link for your latest post is telling me the page is not found and it’s not showing up on the home page, either. Your pictures and tutorial made it look so easy! 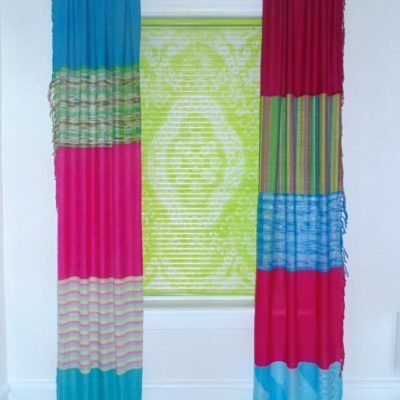 Love the bright colors!